As a lot of you already know from my youtube videos, i finally managed to grow my nails after years of biting (above is a photo of my natural nails, with only a hardener on them). I know how hard it is to grow your nails and to maintain them once they are long. I am going to share a few tips on how i care for my nails and how to keep them long. A lot of it is perseverance, you need to set your mind to growing your nails. If you don't really want nice nails then it will never work. You should start giving yourself weekly/fortnightly mini manicures or if you have some spare cash to spend go to your local beauty salon. You should always file your nails to keep them at a sensible length. There is a knack to filing correctly, the most important thing is never 'saw' your nails with the file, go in one direction on each side and meet in the middle. Sawing your nails will cause the layers to split and your nails will break more easily. After you have filed them you will want to seal off the layers, use the file in the other direction over the tips of your nails (see video below for clearer instructions). You always want to paint your nails, whether it's with a nail hardener or a colour polish. Having your nails painted will help stop you biting as they will look a lot prettier (this is what helped me). Always wear a nail hardener, i recommend Maybelline salon manicure hardeners. These will really help keep your nails strong, the more layers the better (about 2-3) will make your nails stronger and thicker. Always use a base-coat before applying nail polish, i recommend a vitamin enriched base coat. You should give your nails a breather from painting every so often so your nails do not become yellow stained. A lot of people also find it hard to stop biting the skin around their nails, the best way to stop any 'hang nails' is to keep your hands and nails moisturised. Use a good intensive moisturiser, i love Lush 'helping hands'. It makes your hands so soft and silky. 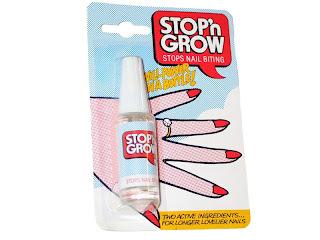 If all else fails you might need to resort to the delicious 'Stop n Grow' :S. This stuff tastes awful but it does the job if your one of those people who bites their nails without realising! As I already said on youtube: Thank you so much!